Were fading, and all wars were done. The image above shows the view on a good day. What if it’s not a good day? Where the temperature is approaching 4-5C (30 40F), it’s windy and wet. If you’re prepared, these are excellent conditions for a walk. If you’re not … well, let’s just say “may the force be with you.” You’ll need it. What do I mean by being prepared? Here’s my gear list. Dry bag in pack containing Fleece, change of clothes. I use a trash-compacter bag as a pack liner. The rest of the “10 Essentials.” Map, compass, headlamp, first aid kit, and cell-phone. This looks like an enormous amount to carry. Especially if you add in my camera and GPS. It isn’t. I’ve chosen light-weight gear. The single heaviest think I carried was water (@ 1 kilogram/liter). The total weight was about 3-4 kilograms. There are five major routes up the mountain. 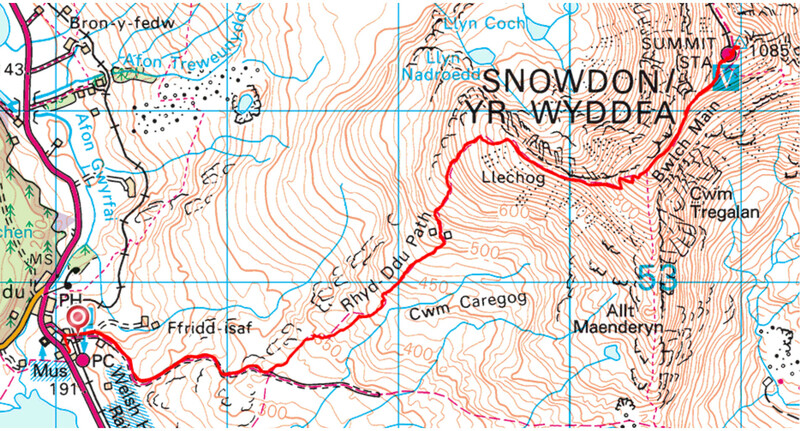 They range from long (following the train) to short and steep (Watkin and Pig trails). 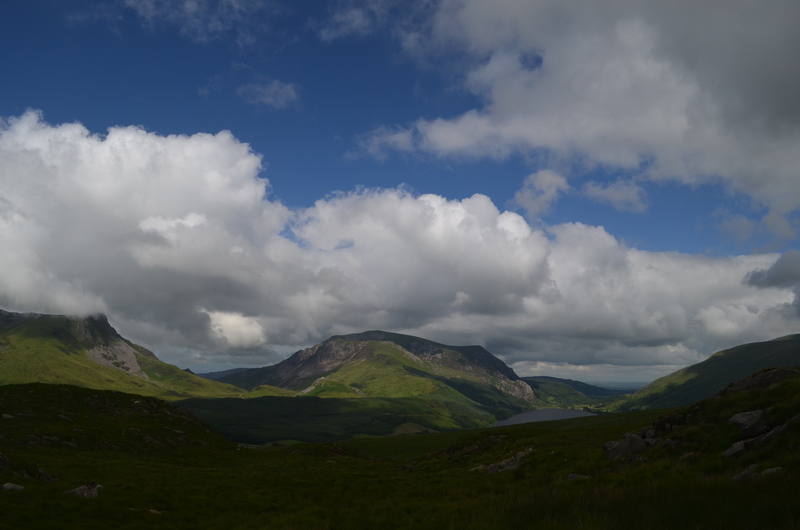 We’ve used the Ranger Trail and Rhyd ddu paths. The Ranger Trail is probably the easiest with children. The Pig trail is the shortest climb, but it’s decidedly steep and the parking lot at the base is always a zoo. An informal survey of the people in the restaurant at the top suggested that most either come up the Pig trail or take the train. This map shows a trip we made a few years ago. We thought hard about coming back this way, as the Ranger Trail is a lot easier to follow in the dense fog. 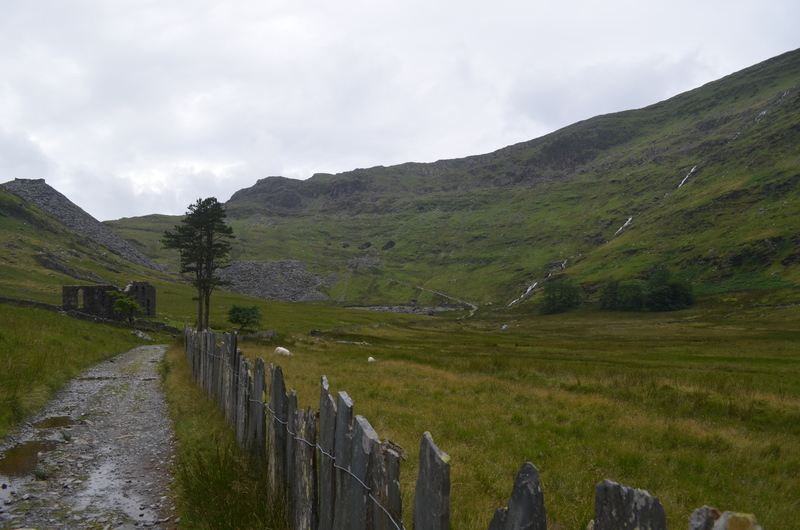 The path across the bottom, through the abandoned slate quarry, is swampy even in a dry summer. 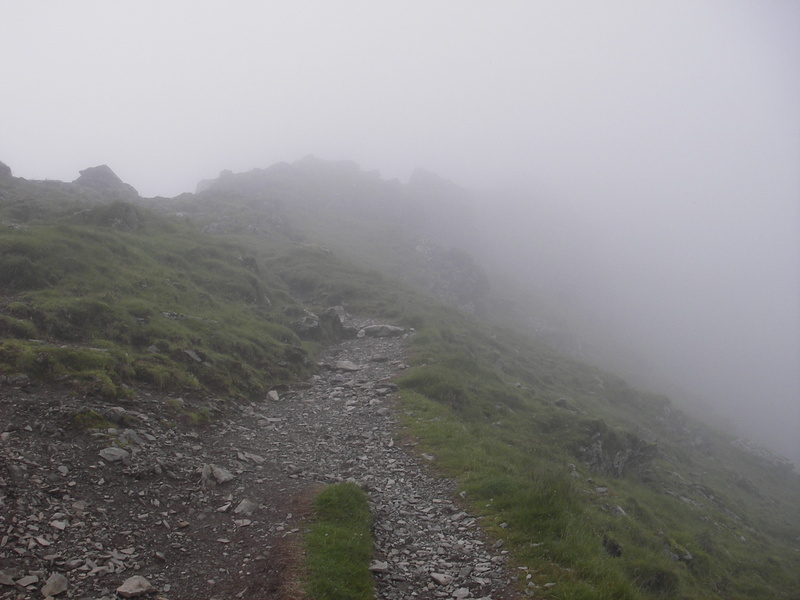 Therefore, rather than face the mire, we decided to take it slowly on the way down. 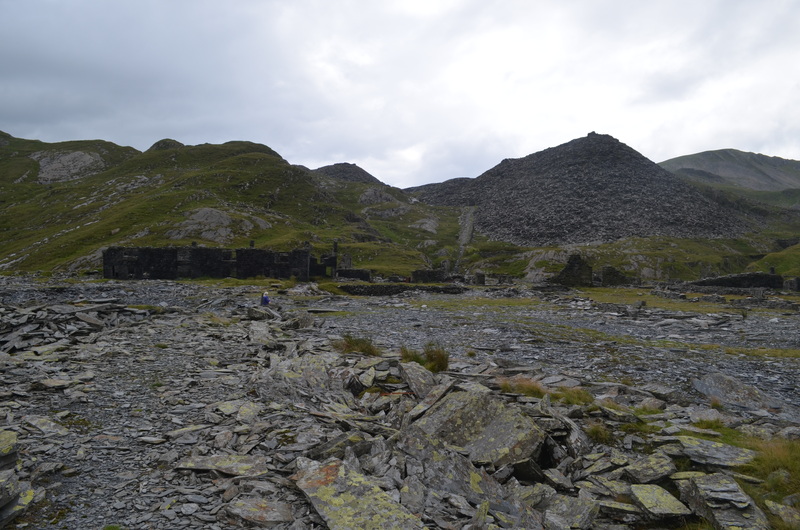 The slate quarry, close up. 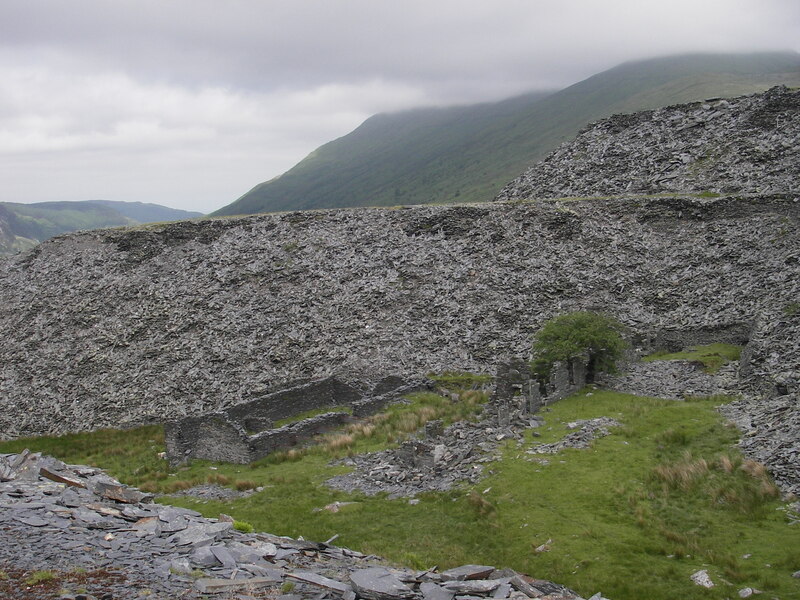 The trail starts with a well-maintained track of large stones embedded in the soft peaty ground. It’s land covered with sheep. We chose shearing day for our stroll; the local farmer had gathered his flock and we started to the noise of distraught ovines. The trail rises faster than you think. I thought we’d been walking on the flat when we stopped here. About 1/3-1/2 the way up, the fog descended. It usually burns off by mid-day. I started out looking forward to purchasing a pint at the top. A few minutes later, a cup of tea seemed a much better idea. Leaving us with this view from the top. 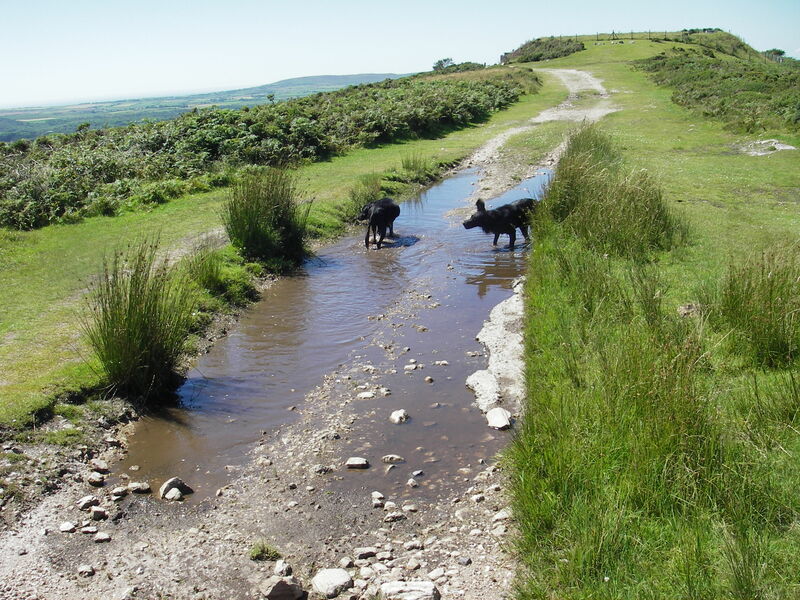 A Fun Walk on the Gower (or Gwr). 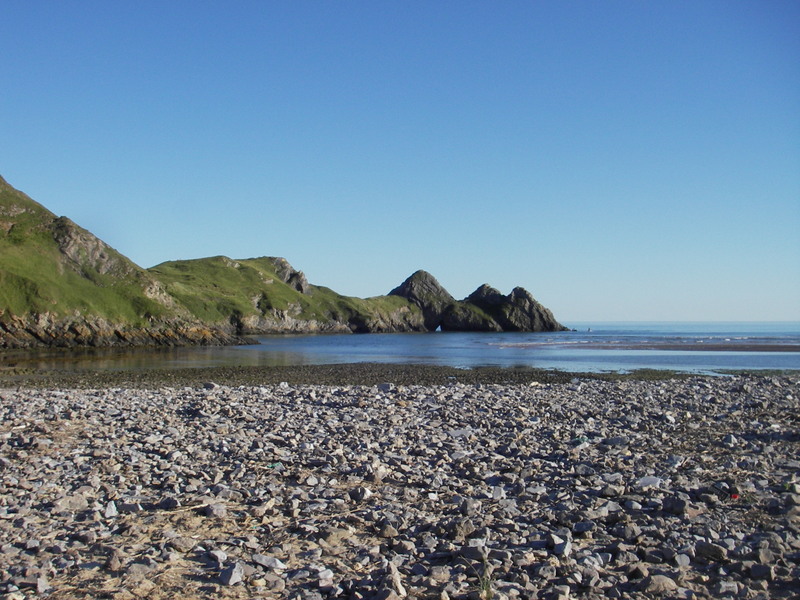 A 13.5 mile, 22 km walk through one of the most beautiful beaches/wild spots in the UK. 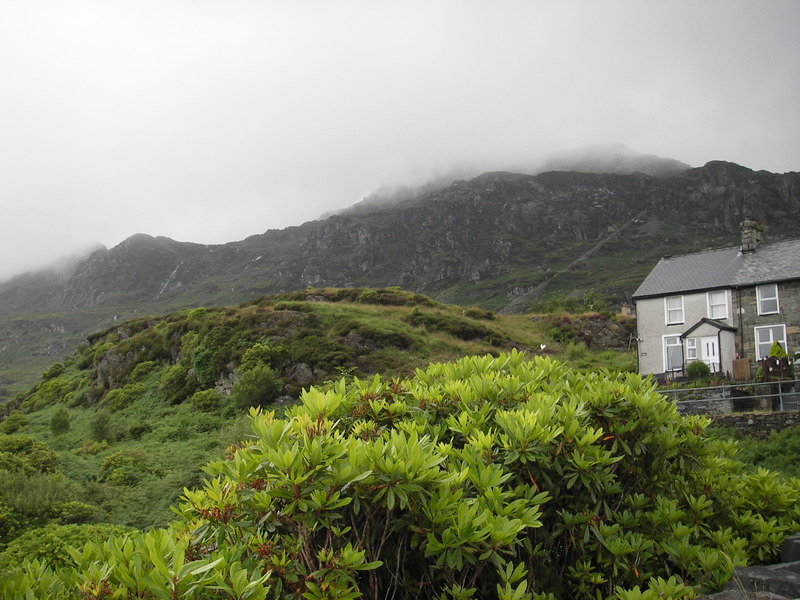 It combines beaches with hills and heather in a unique walk. This is a fairly strenuous walk, at least when the temperatures reach 28 (90ish). 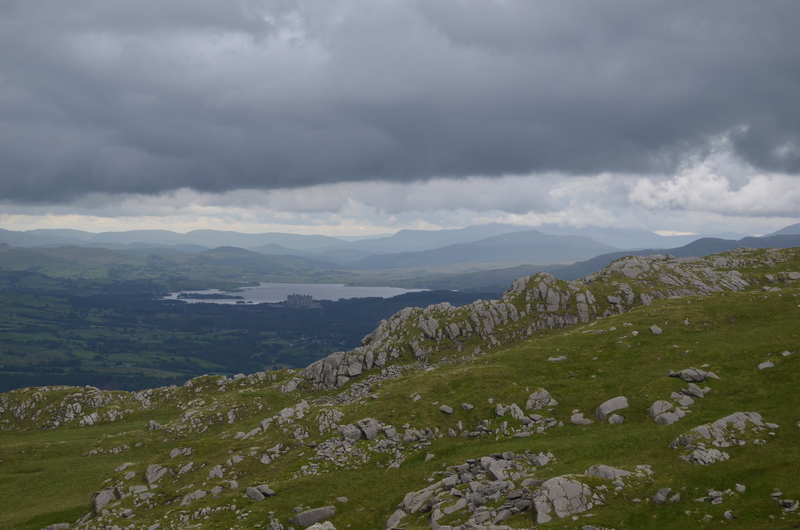 There’s a decent amount of climbing, but no truly long epic climbs (the total climb, about 2400 feet or 740 metres, is most of the way up Snowdon). 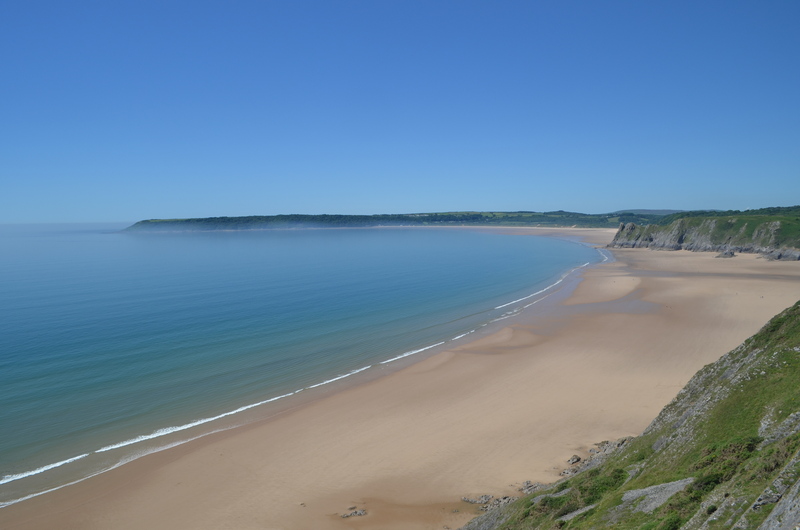 The Gower is about a 2 hour drive from Bristol and an hour from Cardiff. 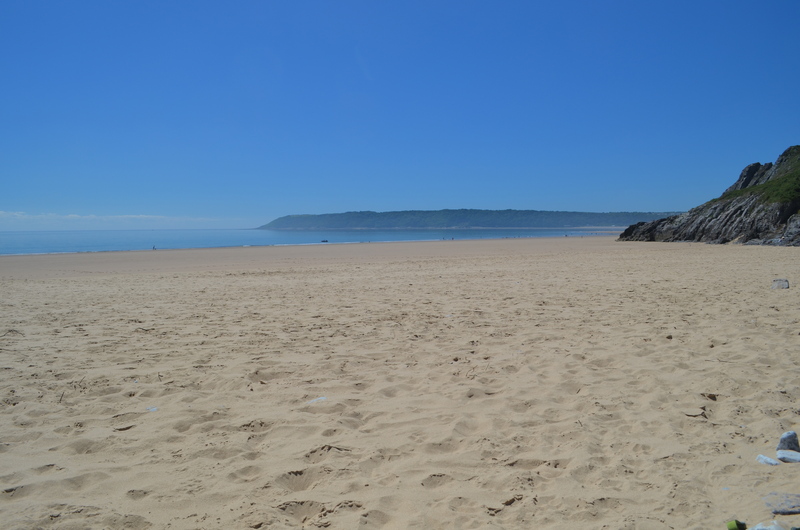 We started about 9 in the morning to miss the rush-hour traffic, stopped at a bakery on the way, and ate our lunch (Pasty’s and bread-pudding) at the National trust car park (3.50 for all day, Oxwich bay is 2.00). 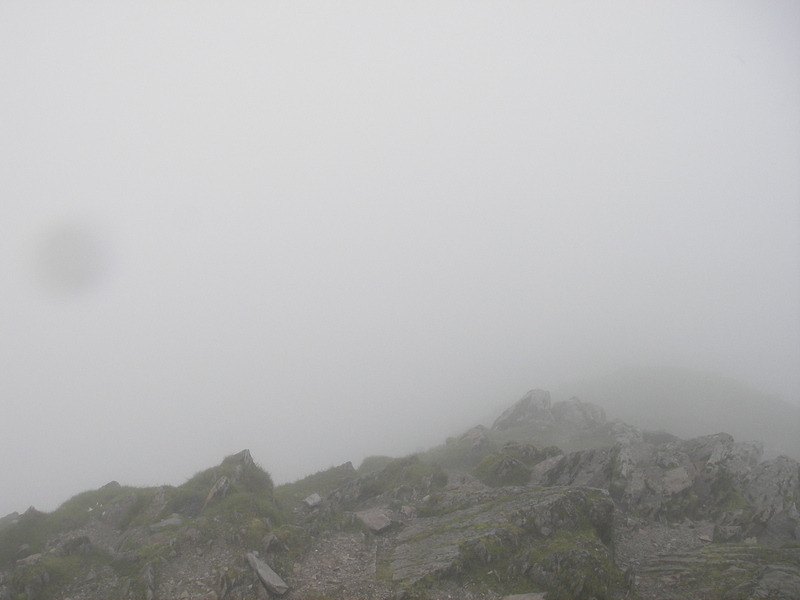 The picture above shows the view from near the top. The tide was out so we climbed down and around the Great Tor. The day was exceedingly clear, so sunscreen would have been a good idea. Hindsight is 20/20. The UV in the UK can be surprisingly strong, even stronger than in the American South. 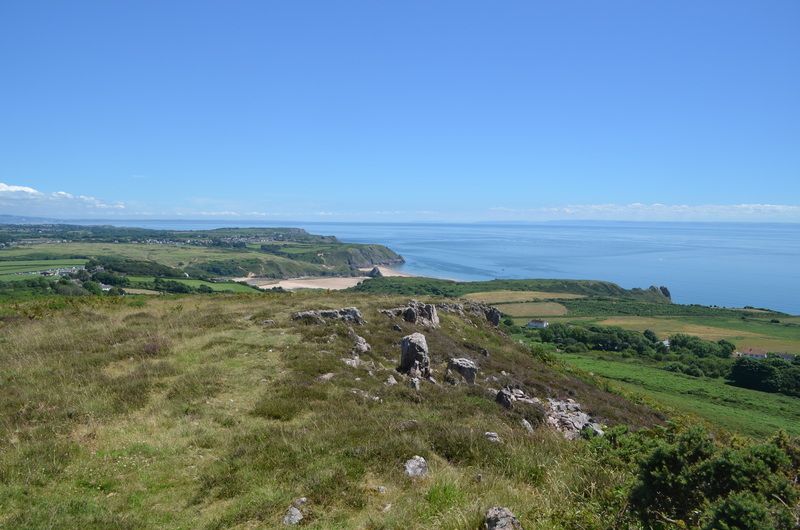 After that we climbed up onto the Gower path which follows the spine of the peninsula. There’s some free parking where the path crosses the main road. This shows our progress. We’re parked at the top of the cliffs in the centre left. The dim blue line at the horizon is Devon. We ran into the first of three Duke of Edinborough crews on this hill. They (the program) seriously need to look at lighter weight pack gear. One of the girl’s packs was forty pounds or so for a short trip. Hers was on the light side. I gave them some Philmont advice (It’s not a race and “Hydrate or die!”) for hiking in the heat. My brother-in-law’s dogs found their own way to deal with the heat. 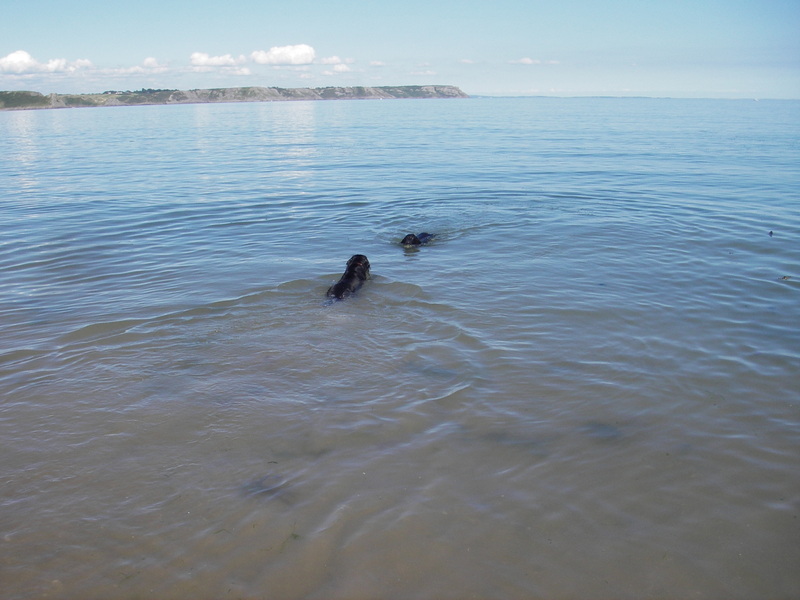 Then we climbed down to Oxwich. We refilled our water bottles at a tap in the campsite – which they may not approve of, but what they don’t know won’t hurt them. (It’s a lovely site, but does not take pets). We also stopped at the store for a choc-ice, which was well-received. 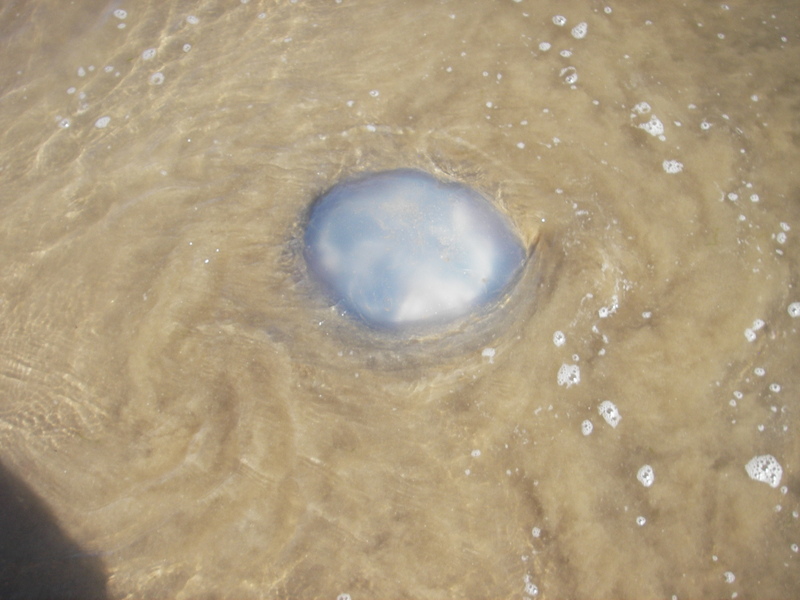 This is an example of a large blue jellyfish that was washed up on shore. There were at least three other species in the water. Most of them don’t sting. 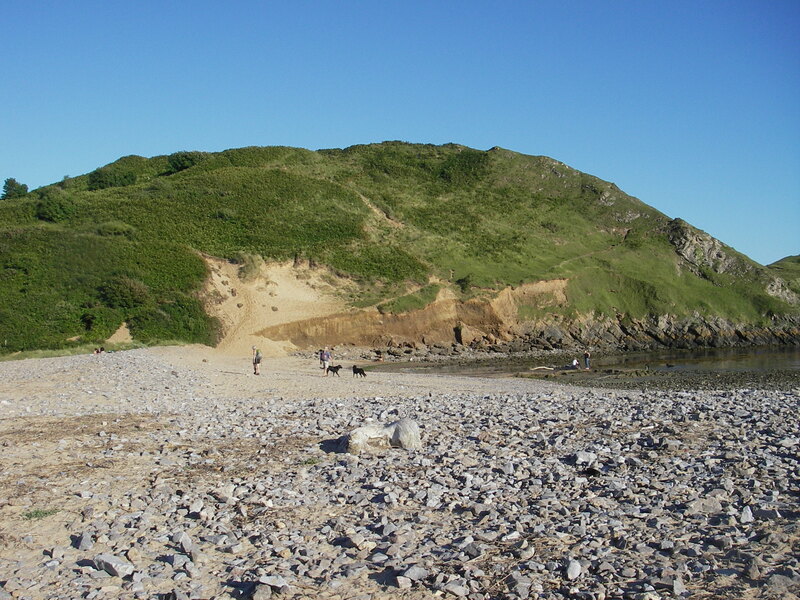 Three cliffs bay with the tide in. 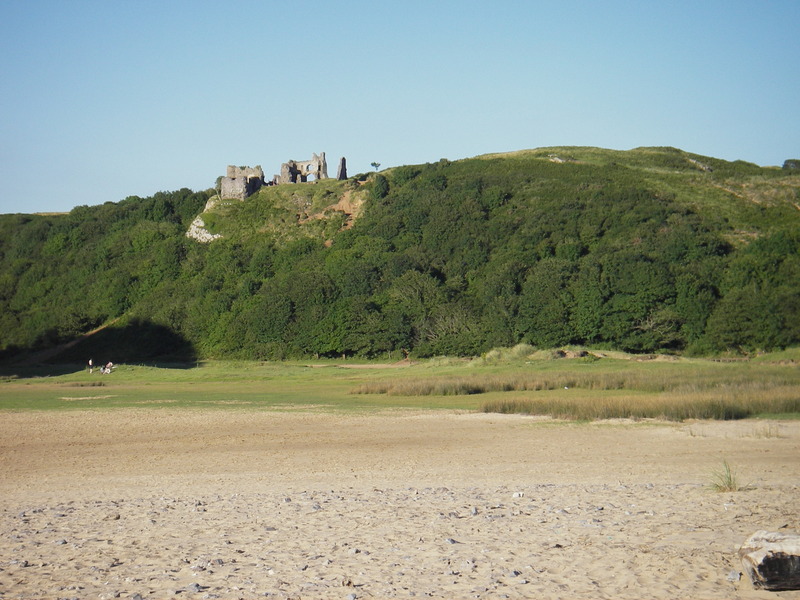 Pennard Castle. It’s in the middle of a golf course, so visit with caution (and keep an ear out for ‘fore’). This last picture shows one of the sandy climbs. Climbing a sandy bluff is much harder work than climbing a stoney path. 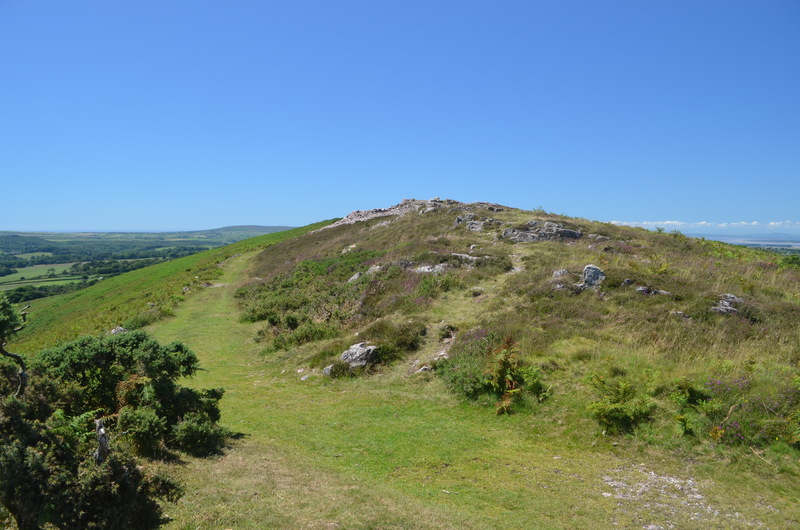 Author rharrisonauthorPosted on July 21, 2016 Categories travelTags England, Gower, trail map, Travel, Wales2 Comments on A Fun Walk on the Gower (or Gwr). 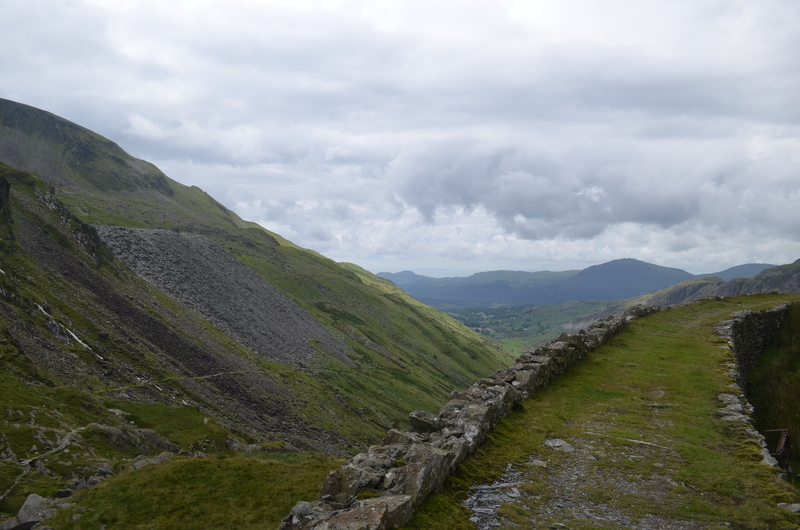 A Yank’s Guide to the UK part 3, Footpaths. In England, the footpaths generally go where the map says they are. There are exceptions, but if you navigate stile to stile, you’ll be OK. The picture shows a style on a typically beautiful summer day. Or perhaps one good enough to be typical. Many of the styles are gates, and the rule is to leave the gate the way you found it. 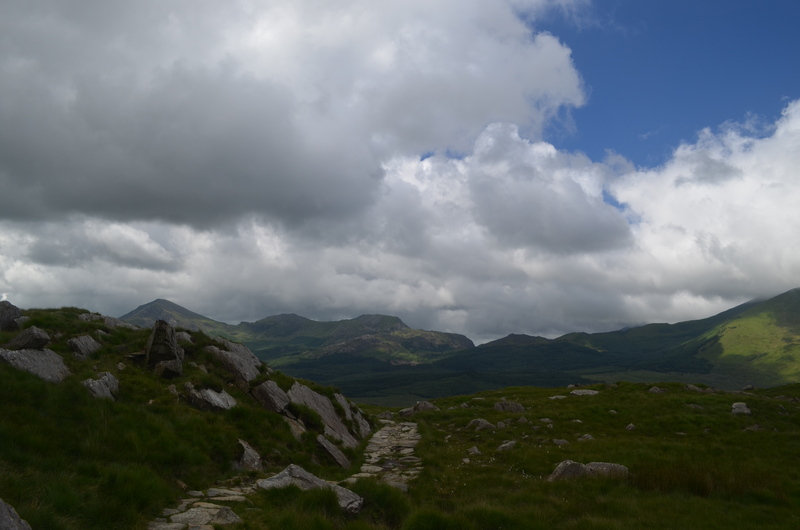 Many of the footpaths follow historic tracks or roads. Often these are sunken lanes where the effort of expanding them for even a single track ‘metalled’ (paved) road would exceed the effort needed to just build a new road nearby. These paths can be ancient. 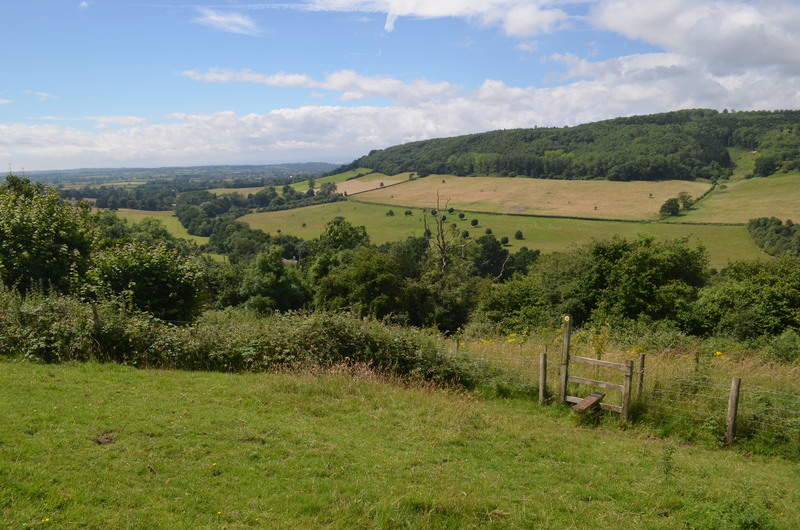 The ridgeway that runs from near Reading to south of Bath dates to the time of the pyramids. It’s sort of exciting to walk on a road that was old and in use when Julius Caesar was a boy. 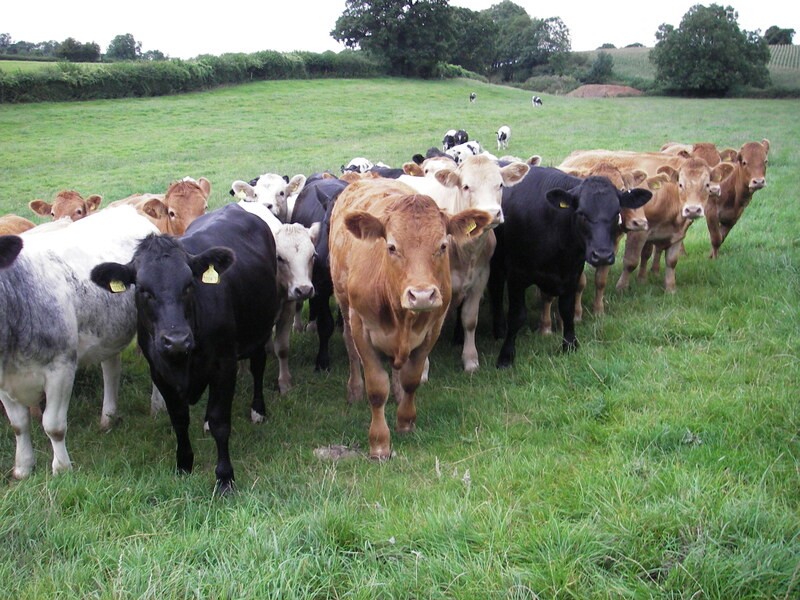 The footpaths often cross fields with livestock. Cows are a real hazard. They are not the calm sweet animals from cartoons and milk advertisements. Big and sometimes ornery, especially the beef cattle which are not handled by people on a routine basis, they need to be treated with respect. Every now and then someone who doesn’t treat them with respect gets trampled. Sheep are extremely common, but other than decorating the trail in their own unique manner, not much of a bother. There are also a fair number of horses, especially in wilder areas. Wales, however, is another story. 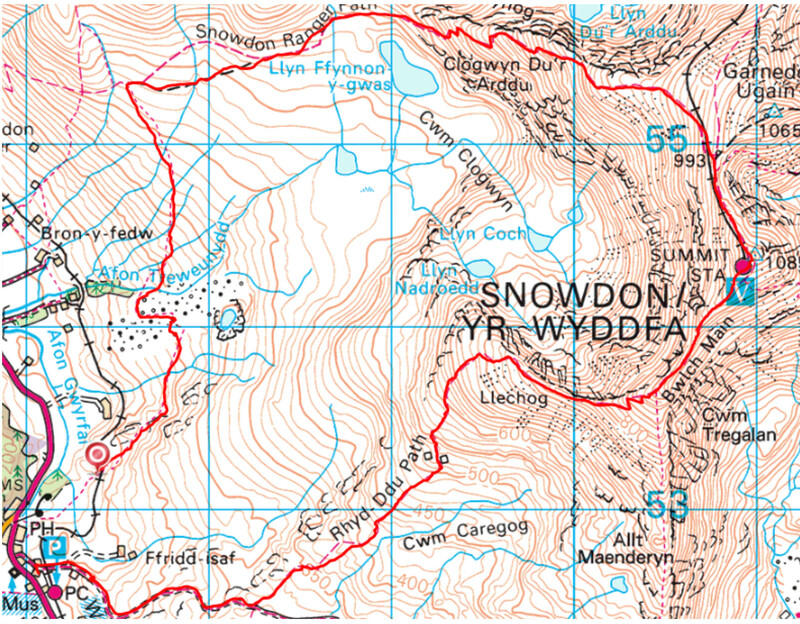 While there are plenty of footpaths and they are marked on the maps, they are often not there in reality. This map from 2013 shows our path … digressing from the footpath. What started as a gentle walk to a pub in a nearby town, became an almost epic journey as we worked our way around closed footpaths. We took the bus home. Trail conditions range from smooth and dry, to bogs, and on to mud pits. 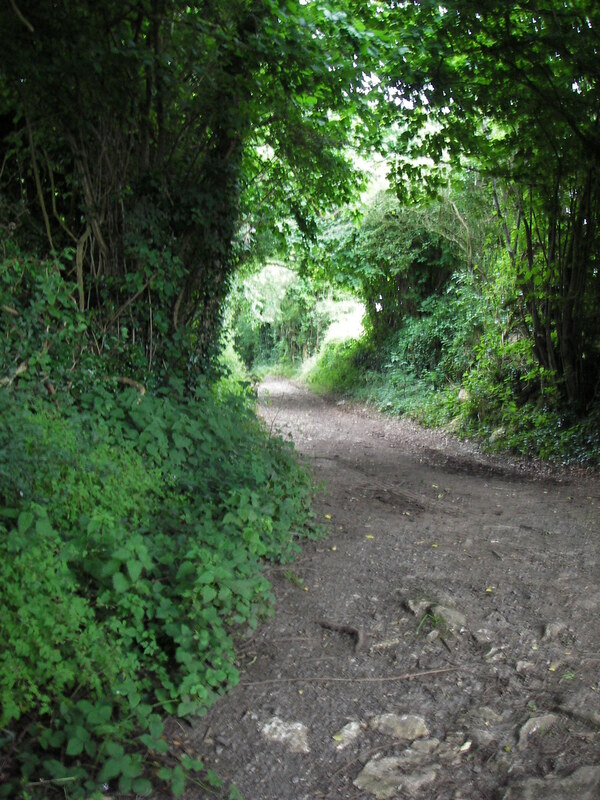 The paths can be wide and easy walking or narrow and filled with nettles. Fortunately, outside of Kew Gardens, there’s no poison ivy. Water sources are few, and you will need to be prepared. I’ll put it up in another post, but my wife and I did Snowdon last week. We were prepared, and needed to be. It wasn’t a bad climb, but the temperature changed from a balmy 20C at the base to about 5C at the top, in dense fog, dripping wet. Hypothermia was a real risk. Especially as you’d be damp from sweating on the climb. So we carried rain gear, winter coats, dry change of clothes, my backcountry first aid kit (which contains a space blanket for a bivy), water, and extra food. We needed the warm clothes by the time we arrived at the top. The point of this is that you have to do your research and be prepared for what you may encounter. This is a fine, relatively unused, 7 mile 2000 foot climb walk. The rain finally held off so we grabbed the chance. The trail map shows the house we’ve hired, but you can park for free near the top of the paved road. We walked in the original quarry road, along a stream and waterfalls. The people in this picture were getting ready to explore one of the many mines on the mountain. Off picture, to the left, is a steep hill of tailings and various miner paths that leads up to an abandoned quarry. We came back that way. Once inside you skirt a lake and then follow an old road to an abandoned village. There’s a bitter-sweet poem, in Welsh, attached to the start of this slate fence. It says they have a new school, an new pub, an new hotel, and it’s all gone. We ate lunch in the middle of the ruins. Our choice dictated by the availability of dry seats. Following the path uphill, did I mention there’s a lot of that in this hike, you reach another abandoned quarry. It’s only the second of six. 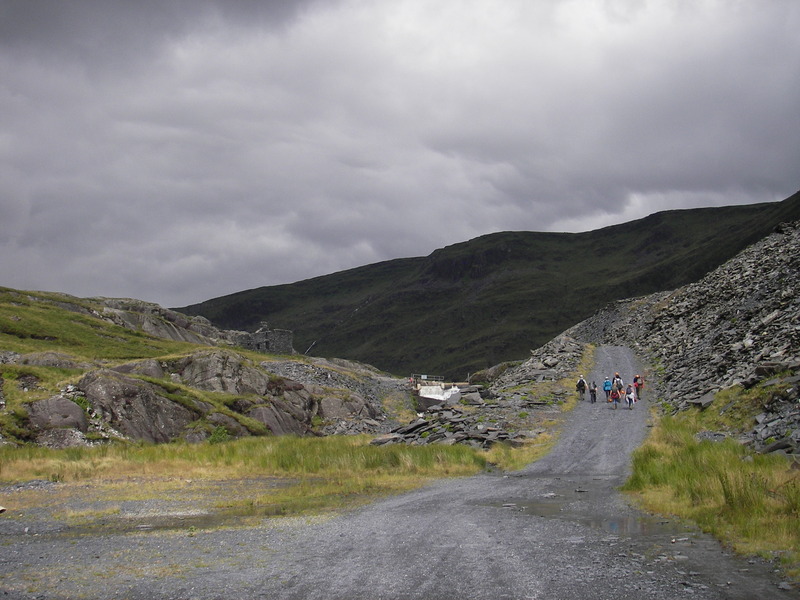 The vertical bar in the background, next to a mine opening, is the reliable and dry footpath. How did we find that out? By trying the others. 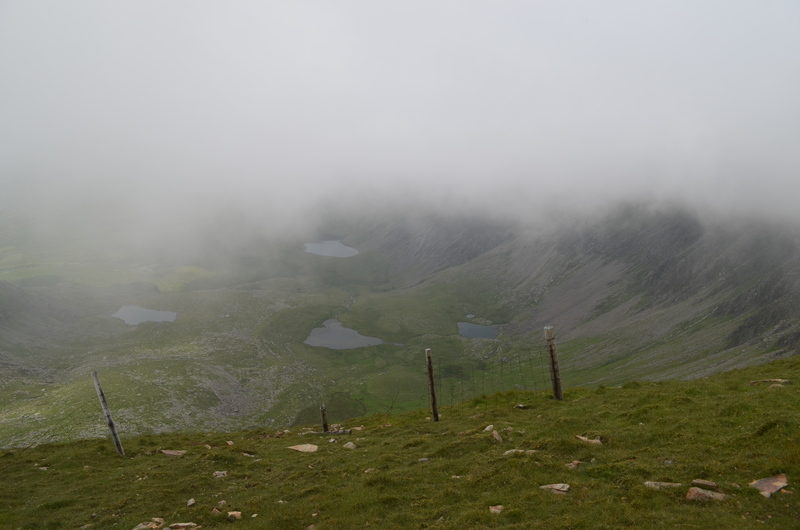 When we got here we realized that we didn’t want to walk down Cwm Creosoe. Following the old gravity slides (only 20% grade or so), leads to a saddle with views like this. We followed the footpath down. Until it disappeared into a swamp. 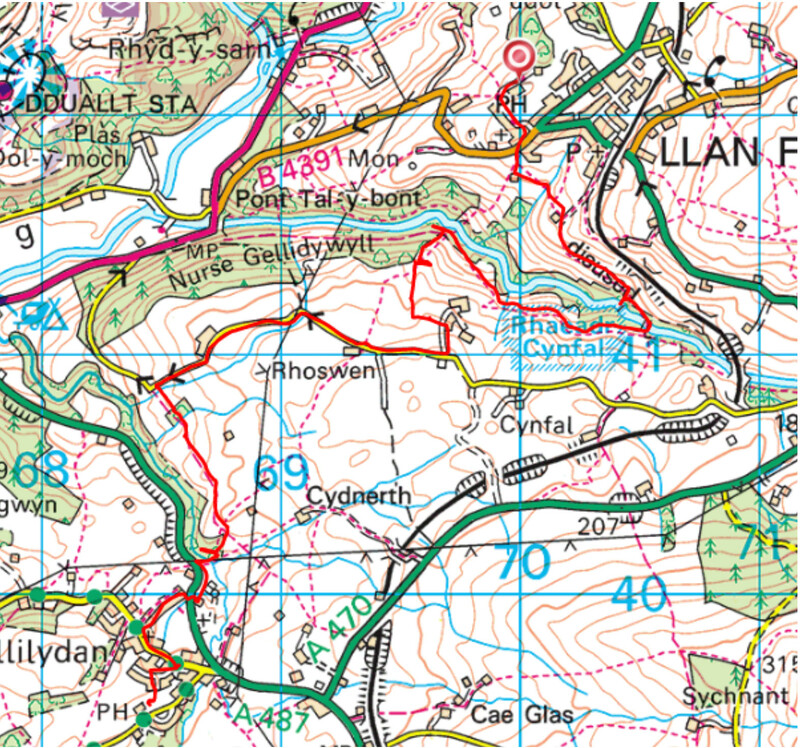 So we ended up following informal paths (Sheep trails) to a final abandoned quarry. Then after a steep decline, we found the path we came up. All in all an enjoyable exploration. Just be prepared for bogs, lots of bogs. A Yank’s Guide to England 2 – Pubs and Food. It’s 15C, windy and raining, horizontally. Not a great day for exploring mountains. Sounds like a pub is in order. Pubs are the great British social institution. Dogs and children are welcome, though you do have to smoke in the garden. (I find this a great improvement, but others feel it is an overbearing aspect of the nanny state.) The best are local, almost community centres, that feel like one big family room. The worst are commercial and somewhat impersonal. None are as awful as an American bar. They’re more than just a dispensary for alcoholic beverages. No self-respecting village is without at least one pub. Originally they were inns and stopping points for the masses. Back before trains when nearly everyone walked, it took more than a few hours to go from one end of the island to the other. Once King Henry destroyed the Abbeys and Monasteries that housed travellers, public houses evolved to fill that role. While some still do, most pubs now don’t have overnight rooms. You’ll also read about licensing rules and pubs closing at strange hours. These were introduced to help win ‘the war to end all wars.’ The first one of those wars, a hundred years ago. One of the best things labour ever did was to revoke the rules. Now pubs are open when there’s a market for their services. (which means in the country, don’t count on them being open out of hours). By the way, the drinking age is 18. Pubs come in basically three flavours: free house, brewer associated, and chain. Chain pubs are franchises like McDonalds, reasonable places, but nothing super special. Brewer associated will have a brewer’s name over the door. They get a deal from or may be owned by a brewery. In Berkshire around Reading a fair number of pubs used to have ‘Courage’ over the door which was a nice touch. Free houses are owned outright by the publicans and serve whatever beers they want. Free houses are usually the best, the most idiosyncratic, and typically British you will find. I aim for them, and so should you. Ordering: Typically you walk up to the bar and wait your turn. There will always be some ‘locals’ i.e. people who haunt the pub as their almost primary residence. You may have to wait a bit to be noticed. Be polite. They will pointedly ignore a ‘loud Yank.’ Beer comes in pints and half pints. Ask for what’s the best bitter and you won’t be disappointed. American beer is lager. A typical ‘lady’s drink’ is lager and lime. You cannot get that in the USA, so even if you’re a bloke, give it a try. Cider is alcoholic. You can get a variety of soft-drinks for the children. The fruit squashes are very sweet. You also would order food here. It’s good manners to know what you’re ordering before you go to the bar. After all other people are waiting for their drinks. Pub Food: The French believe the British can’t cook. They also believe chicken is suitable for vegetarians. At least they’ve got something right. The thing about the British and the English in particular is they won’t complain. Some restaurants take advantage of this to serve awful food. The good ones won’t. The British also became accustomed to pretty bloody awful food during an unfortunate event in the middle of the 20th century. And they never were fond of snails – or frogs. Good pub food can hold its head up with respect to any cuisine in the world. Things to try are: fish and chips, Sausage and chips, and meat pies with or without chips. I’d skip a ploughman’s. They tend to be overpriced. You may be offered ‘mushy peas.’ They are an acquired taste, but you should try them at least once. Never mind that they look like something the cat regurgitated. You may get a chance to have ‘black pudding.’ Take it. Pizza has made it to the UK. It’s served as pizzas. Each typically the size of a plate and for one person. Digestive biscuits are a delight. The base biscuit is similar to graham cracker, and you can (should) get them covered in chocolate. Ginger nuts are another biscuit worth tasting. American children often subsist on digestives when visiting the UK, since everything tastes a little different. Bacon is different. It has meat in it. Lots of meat. Enjoy it while you can. Sausage. My in-laws wonder why my wife and I binge on this when we’re here. Especially why we have the inexpensive plain sausages. It’s a unique and addictive flavour. One you can’t get back in the good ol’ USA. Baked Beans. I only mention this because some people are in for a surprise. I wouldn’t bother with them in the UK. No where near as good as in the USA. Fruits and Veggies. There’s a huge variety here now. This may change with Brexit. With apples especially, look for varieties that aren’t found in North America. Strawberries are also much nicer than you can get at home. Cheese. The UK has its own varieties and they are excellent. Try Leicester, Cheshire, Wensleydale, Stilton, and mature (local) Cheddar. The orange brick cheese in the US will pale in comparison. This isn’t a long hike, sort of a rest day. We needed a small number of supplies from the local Co-op, it is rainy, windy and cold. A welcome change from Atlanta where it is dry, hot (95F, 34C), and smelling of car exhaust. There is a steam train, so we do get the occasional wiff of coal smoke. That’s a welcome change. 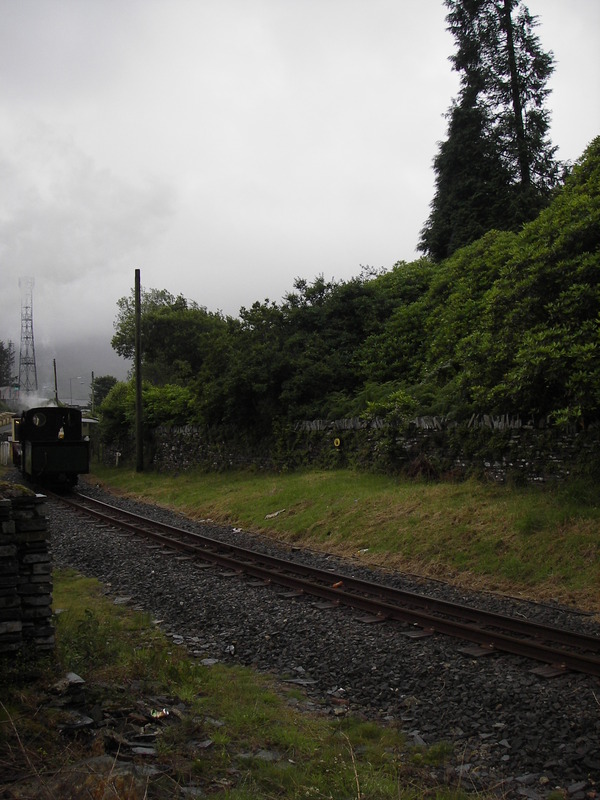 The local websites give the times for the Snowdon train, but we’ll do that trip under our own power. There’s a 35L ticket that lets you use this train and the busses all day. 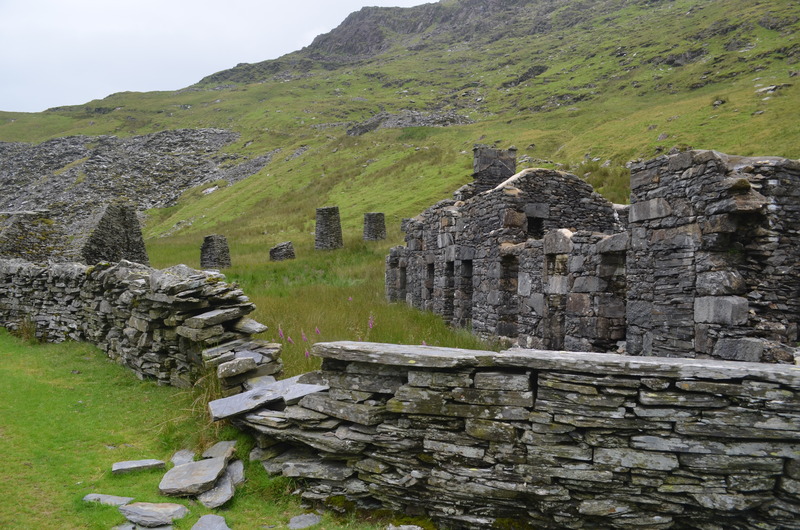 We hiked first uphill and across the face of old slate workings. Originally I planned to go for a longer bit of the trail, but the soil is completely waterlogged. It is a normal Welsh summer. The tracks, sans train, run uphill from the house we hired. 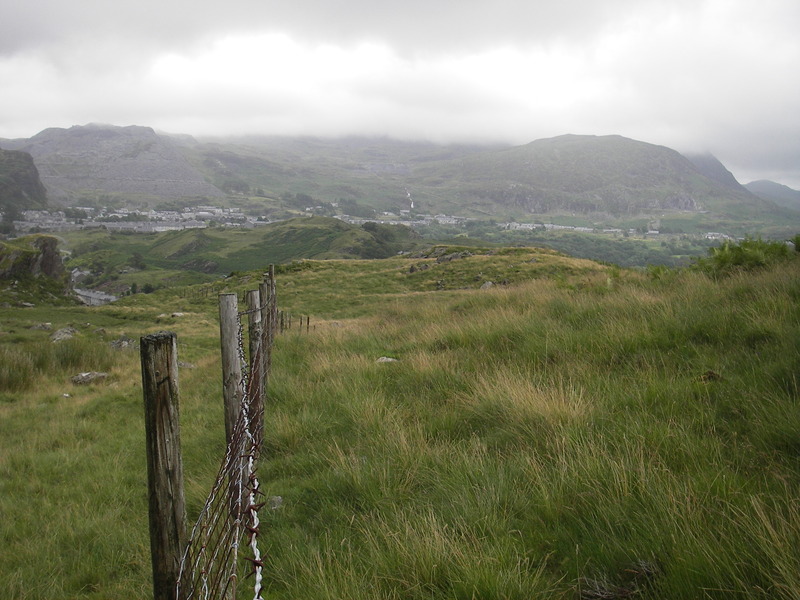 Blaenau Ffestiniog from the hill. Our feet were still dry at this moment. The clouds cover the mountains in this weather. Serious wet-weather gear is a necessity in these mountains. This is a place where you can get in trouble quickly, and not for speaking English in the Y Tap (a Welsh language pub that’s only a kilometer away). 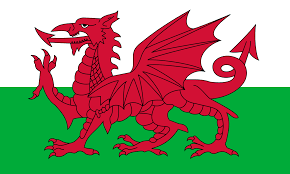 Welsh flags are everywhere. They did well in the EU cup, not so well in the Brexit vote.